Tri-Card Poker is a popular poker game by RealTime Gaming. Despite the fact that the game involves only three cards, the game is much more fun than the regular poker. The wagering limits are between 1 and 100 credits. You can decide whether to place the Ante bet or the Pair Plus bet or both. For those who are new to poker, ante bet is when you wager that your hand will beat the dealer’s hand. Pair Plus Bet is when you wager your hand contains at least one pair. In order to start the game, you will have to choose between these two bets. If you want to increase, you can click on “Raise”. Payouts are mentioned in detail in the menu located on the left-hand side. The payouts in the game begin with one pair (1:1) and the top is the Straight Flush with 40:1. 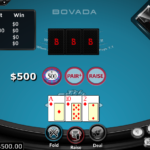 The online version of this poker game is extremely engrossing and fun to play. Though there is no bonus round in this game, learning how to play and understanding the strategies could ensure that you win many rounds of this game. The Tri-card poker follows the same rules as the regular five-card poker game. The only difference here is that there are fewer cards. The dealer requires a Queen or higher in order to qualify. Since the game is shortened, a few of the usual poker hands are not possible, and hence, you will not see them on the pay table. 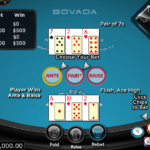 In the play bet and the ante-version, the player can choose whether to make an ante bet or not. The dealer then deals the three cards each to the player and to the house. 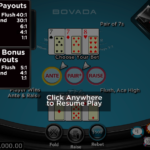 The player can now play or fold. Since the house edge is double than the other games, casinos usually love this game. This tri-card poker by RTG is a delightful game that will challenge you at every turn. The game has been flawlessly designed and ensures a good time. For another great and engaging game you should consider playing Tiger Treasures by RealTime Gaming.